Maggie Furey was born in North East England. She is a qualified teacher, but has also reviewed books on BBC Radio Newcastle, has been an advisor in the Durham Reading Resources Centre, and has organised children’s book fairs. She now lives in County Wicklow, Ireland. Artifacts of Power — (1994-1997) Publisher: To the city of Nexis, where Magefolk rule uneasily over a race of mortals, a young girl named Aurian comes to learn the magic arts. Her dormant powers are coveted by the corrupt Archmage, who intends to possess her. When she rejects him for a mortal, the enraged Archmage plans his revenge. Shadowleague — (1998-2002) Echo of Eternity has also been published as Eye of Eternity. Publisher: Three unlikely heroes must penetrate a land of sorcery and secrets to save a world hurtling toward chaos. 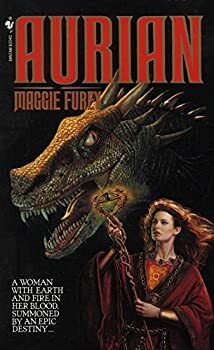 From the dazzling imagination of Maggie Furey comes an astonishing new epic of a wondrous world on the brink of collapse… and the daring trio who will risk the deadliest odds to save it. The world of Myrial is racing toward apocalypse. For aeons, its mysterious Curtain Walls have functioned to separate realm from realm, and race from race, so that each cordoned area remains a sanctuary for its species. But now the miraculous walls that have provided order for so long are disintegrating with disastrous results. Mingling climates are causing unrelenting rains or deadly droughts, while warlike races are preying mercilessly on the helpless and meek. And the carnage will only grow worse unless a seasoned woman-warrior, a brazen firedrake, and a venerable Dragon with amazing telepathic powers — all trusted members of the Shadowleague — succeed where everyone else has failed. For they must first locate the heart of Myrial, where the secret for undoing this disaster resides. In order to reach their goal, however, they must overcome treachery, intrigue, and evil — and a mysterious figure from the past whose actions threaten to tear the Shadowleague apart. The Chronicles of Xandim — (2008- ) Publisher: This series returns to the lands of Aurian, and is set in the distant past of the Magefolk, when even the land was a different shape, and the sea between the northlands and the south did not exist. This was the time when the Artefacts of Power were created, and lives were torn apart by the Mage Wars. In those days, the Magefolk were comprised of four disparate races: the human Wizards, masters of earth magic; the winged Skyfolk, who controlled the magic of air; the Leviathan, who ruled the powers of the watery realms; and the great Dragonfolk, whose province was the magic of fire. But while the four races of the Magefolk strove and vied amongst themselves to master the powers of magic both good and evil, a new race was emerging, who would come to play a vital part in these phenomenal events. As the story opens, the Xandim are little more than simple beasts. Enslaved by the fey and powerful Phaerie, masters of the Old Magic, they have been trapped in their horse forms for so long that they have forgotten they once held a human shape. Only one of the tribe knows better: the Windeye, the shaman of the Xandim. This is the story of his epic quest to free his people.